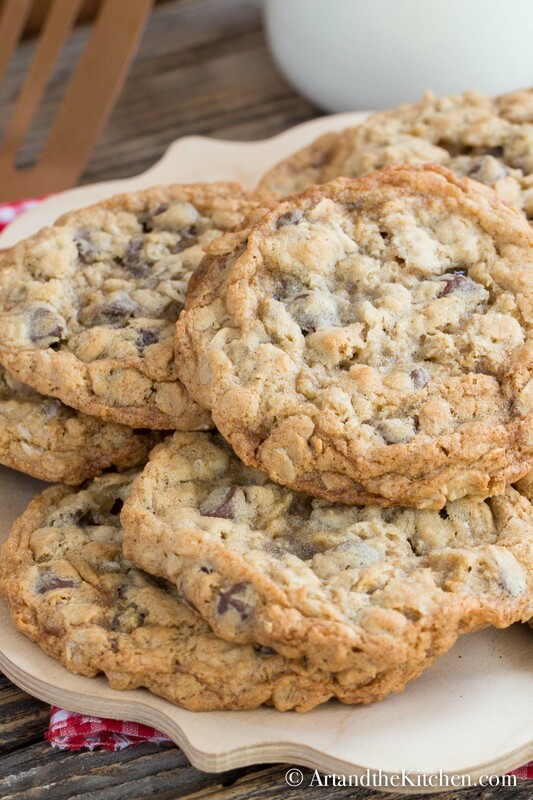 This recipe for Ultimate Chocolate Chip Cookies makes a cookie that is crisp on the outside and chewy on the inside. Adding oatmeal and a high proportion of brown sugar give these cookies that perfect chewy texture. Nothing beats a great homemade cookie fresh out of the oven! 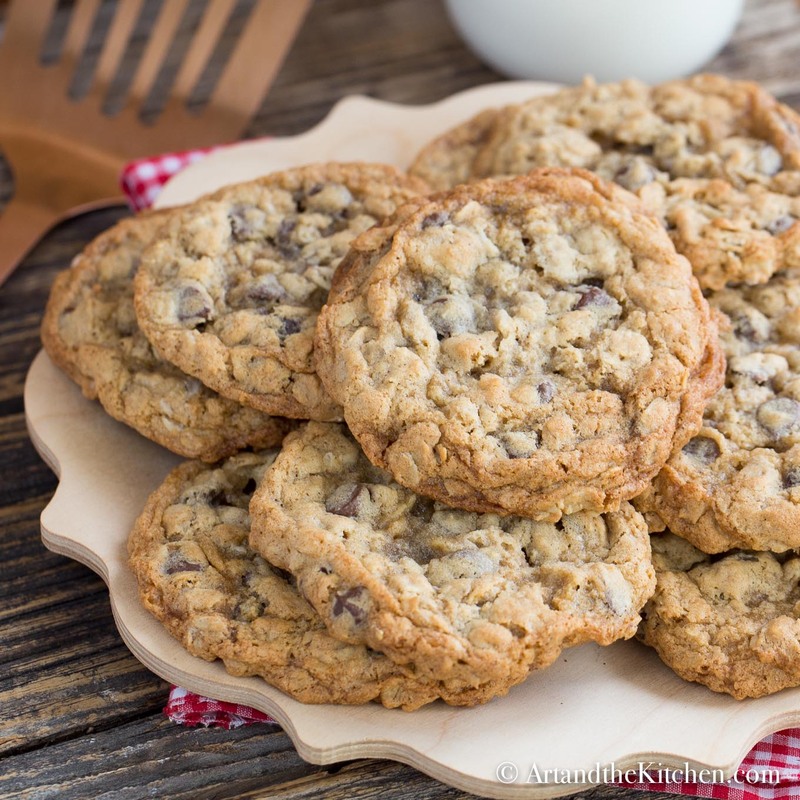 Do you have special memories from your childhood of your Mom or Grandma baking cookies? Peeking through the oven window eagerly anticipating that first bite of a cookie. 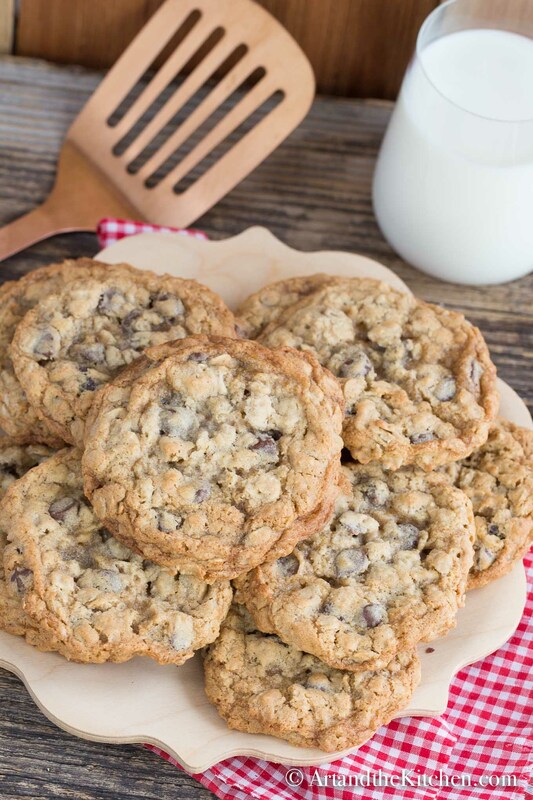 This recipe makes about 3 dozen cookies, so if your family doesn’t gobble them up instantly, pack some in an airtight container and freeze them! 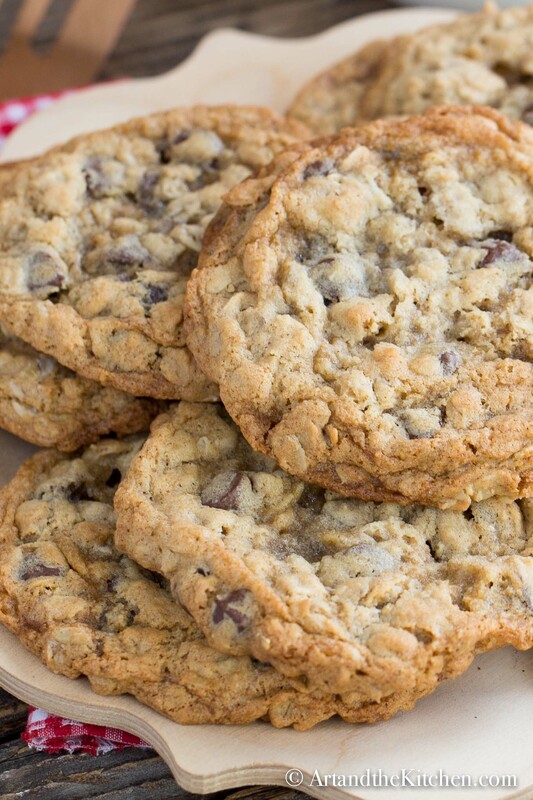 Some tips to making the perfect Chocolate Chip Cookies. The butter should be soft (room temperature) not melted. If your butter is too soft cookies will be oily. The eggs should also be a room temperature. Cream butter and sugars for 2-3 minutes until its fluffy before adding eggs. I use a spring-loaded scoop to make cookies that are uniformly sized. Line cookie sheets with parchment paper. This helps cookies from getting too browned on the bottom and sticking. Do not over bake, cookies will continue to bake a bit after they are taken out of the oven. Leave cookies to cool on cookie sheet slightly before transferring to avoid them breaking apart. 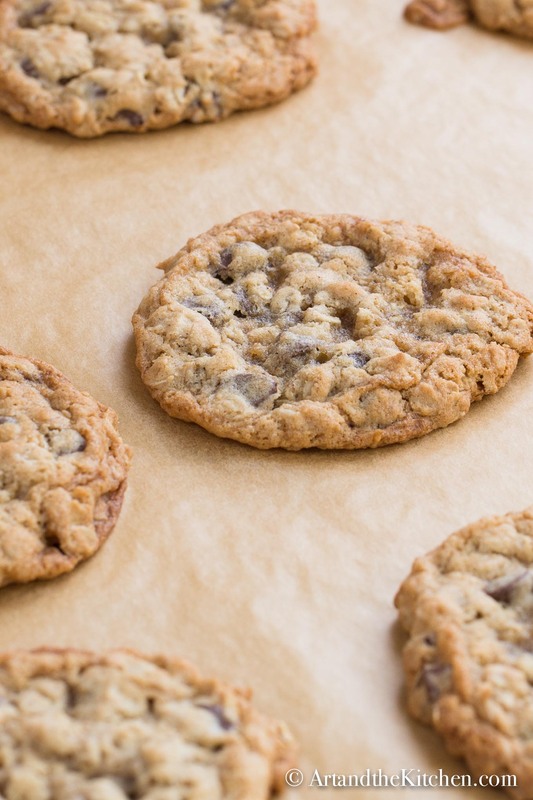 The perfect chocolate chip cookie recipe with cookies that are crisp on the outside, chewy on the inside. In bowl mix together flour, oatmeal, baking soda, salt and cinnamon. Set aside. Using standing mixer or electric mixer on medium speed cream butter until light and fluffy. About 2 minutes. Add sugars and beat until combined, about another 2 minutes. Add eggs and vanilla, mix until combined. Turn mixer to low speed then gradually add flour mixture. Mix just until combined. Using ice-cream scoop place cookie dough on baking sheets about 2 inches apart. Bake for about 12-14 minutes until cookies are lightly browned. Allow to cool slightly on baking sheet before transferring to cooling rack. *adapted from Duchess Bake Shop Cookbook. I am finishing up with making these as I type. They are delicious!! I made mine smaller than the recipe recommends, but still a good size cookie. Got 4 doz. I could eat these for breakfast with all the oatmeal 😉 Well heck, I could eat these anytime. I put extra choc chips in. Next time I’ll put less choc and add some walnuts and/or pecans. Hi Kathy, its 350º 1st line of recipe instructions. Hope you enjoy the recipe. thank you Jody, love the addition of raisins. love the texture of these! chewy but still soft in the middle. might be my families new choco chip recipe thanks!!!!!! thank you Sandy, my family loves them as well. They don’t last long. When the recipe calls for “flaked” oatmeal, and not instant, do you mean whole rolled oats, steel cut oats? What kind specifically? Hi Amanda, I use whole rolled oats, not steel cut oats. I buy large flake oatmeal. I have made these cookies and the whole family says they are delicious. I used a baking stone at first instead of using parchment paper on a cookie sheet. I quickly learned that the cookies fell apart rather quickly by using the wrong thing to bake them on. Once I switched to using parchment on a regular cookie sheet, the cookies came out perfectly. The recipe is perfect! Hello, Do these freeze well? My chocolate chip cookies come out tasting like a busicuit. What am I doing wrong? Hi Colleen, I’ve never had the cookies taste like biscuits, so I’m unsure of what would have went wrong for you. This is a very similar recipe I was given years ago for Mrs. Fields chocolate chip cookies! Only you grind the oatmeal into a flour with the steel blade of a food processor. The oatmeal does deliver a different flavor. This is a good recipe, but sure your use rolled oats and not steel cut. I made cookies with the ‘Coach’s Oats” once and don’t ever do that, even though it has a recipe on the bag. Total disaster! I made these yesterday. So ridiculously delicious. I’ve found my new favorite cookies. Thanks for great recipe. Can these be made into bars. That would be great for party size events. Hey Kathy, I don’t think this recipe would work as a a bar. 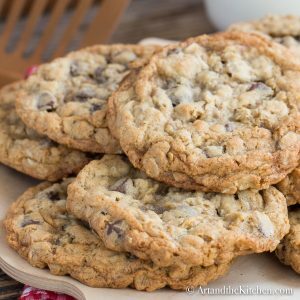 I was looking for a good oatmeal chocolate chip cookie recipe and came across this one. Really appreciate the recommendations of using room temperature butter and eggs. I used peanut butter milk chocolate chips and the cookies were delicious! My husband likes crispy cookies so I just let some brown a bit more and he was happy. The rest of the cookies I took out as recommended and my daughter was happy. I like them either way. Great recipe … will definitely make again! Thank you so much Merry Ellen! Can these be made into a cake chocolate chips for a art palette that I need to make .Thanks! !